"Pimpernel" redirects here. Pimpernel may also refer to Taenidia (plant). For the 2nd century BC grammarian sometimes thought to be named Anagallis, see Agallis. 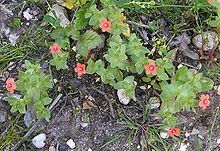 Anagallis is a genus of about 20–25 species of flowering plants in the family Primulaceae, commonly called pimpernel and perhaps best known for the scarlet pimpernel referred to in literature. The botanical name is from the Greek, ana, "again", and agallein, "to delight in", and refers to the opening and closing of the flowers in response to environmental conditions. These are annual or perennial plants, growing in tufts on weedy and uncultivated areas. The stems are prostrate or decumbent. The leaves are opposite, rarely whorled, and sometimes with a few alternate leaves at the end of the stem. They are usually ovate in shape with a cordate base. Some of the species produce flowers of various colors. The flowers are radially symmetrical and have 5 sepals. The corolla consists of a short tube and 5 lobes. The tube may be so short that the lobes appear to be separate petals. They are usually solitary in the leaf axils, but sometimes are on short spikes at the end of the stem. Pimpernel flowers remain open only under direct sun-light. The stamens are opposite the corolla lobes. The staminal filaments have conspicuous hairs. The ovary is superior, globose, and circumscissile near the middle. They were traditionally classified as members of the primrose family (Primulaceae), but a genetic and morphological study by Källersjö et al. showed that they belonged to the closely related family Myrsinaceae. In the APG III system, published in 2009, Primulaceae is expanded to include Myrsinaceae, thus Anagallis is back in Primulaceae again. Another study by Ulrika Manns and Arne A. Anderberg (2005), based on molecular phylogeny, states that Anagallis in its present circumscription is paraphyletic and should also include in its clade the small genera Asterolinon and Pelletiera, as well as two Lysimachia species (Lysimachia nemorum and Lysimachia serpyllifolia). ^ Ulrika Manns and Arne A. Anderberg (2005). "Molecular Phylogeny of Anagallis (Primulaceae) Based on ITS, trnL-F, and ndhF Sequence Data". International Journal of Plant Sciences. 166 (6): 1019–1028. doi:10.1086/449318. ^ a b "Anagallis minima". Germplasm Resources Information Network (GRIN). Agricultural Research Service (ARS), United States Department of Agriculture (USDA). Retrieved 2 January 2018. Wikimedia Commons has media related to Anagallis. This page was last edited on 24 June 2018, at 17:39 (UTC).